Google AuthorRank is among the most trending SEO topics today, and is the subject of conversation on many blogs and forums. Chances are, in the near future, it could change search rankings as we know them. A while back, we discussed at length about what AuthorRank is, and how it's different from PageRank. Google obviously is trying to get more and more people to use Google+, so that authors can be socially recognized, and then associated with a website's content. But while Google is at it, AuthorRank won't start working out of the box. 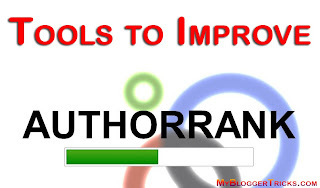 You will have to make adjustments to your site too, and incorporate Authorship. That said, let's take a look at some tools that will help you get started, and improve your AuthorRank for, and when, it really starts influencing search results. OK, this is a nice starting point. Google provides you with a free Structured Data testing tool that you can use to check whether the Google Authorship markup is working correctly on your website or not. This is especially important for multi-author websites, as often times, Authorship doesn't show up for all the authors. Just go to the Structured Data tool, and enter a URL. You can also paste an HTML code snippet. This tool will show you the result for that page as it would appear in Google Search. Not only that, it will show you a lot of other information that will help you identify any problems with your markup. Google Webmaster Tools (GWT) Labs is a collection of relatively new tools that Google is still currently working on and improving. But you can still benefit from them. Once of them is the Author Stats tool. You can access the tool by logging into GWT, then clicking on your site, an then from the sidebar, selecting Labs >> Author Stats. This toll will show data for each site you're currently verified for, and not just the current website. whose dashboard you're exploring - although you can filter out the statistics. Not every blog post you write shows up in search results along with your display picture. With this tool, you can see which posts are. It will also show you the impressions, clicks, CTR, and average search position. You can use this data to gain insights into which of your content is doing well, and what topics are you gaining authority in. You'll find this very useful if you're running a WordPress blog. You can fully integrate your posts with this service to get more advantages. Quickly authorize your posts using this plugin, monitor your submissions and more. It only takes three steps.